Which repair do I need? You are here: Home / Which repair do I need? Unsure whether you need the “Glass-Only” or “Glass & LCD” option? 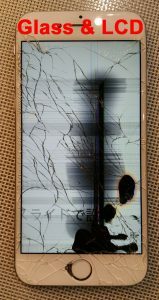 90% of our screen repairs are glass-only. All modern smartphones have optically-bonded screen assemblies and replacing the glass by itself is no easy task. Our glass-only repair requires maximum effort and serious machinery: First your device is dismantled and the screen assembly extracted. Depending on the design, the assembly can be heated and panels cut apart with strand of molybdenum or it can be cooled to -150C in a cryogenic freezer to break apart the optically-clear adhesive. Afterwards the glass is discarded and the remaining adhesive is carefully removed from the LCD. The LCD is then taken to clean-room where a machine applies optically-clear silicone to the surface. A new glass panel is placed into an alignment-jig with the LCD and they are transferred to a vacuum-chamber. In a zero-atmosphere environment the glass and LCD are pressed and sealed together. Now the screen assembly is hermetically sealed and it can be transferred to a 10-atmosphere autoclave where the optically-clear adhesive cures. After 10 minutes the screen assembly is taken out and a stamping press fuses the plastic mounting-frame to the outer edges of the glass panel. Finally, the screen assembly is reinstalled in your phone. Original Apple LCD panels can only be obtained directly from iPhones. 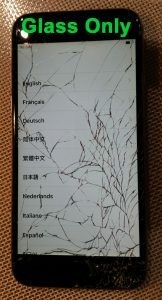 Other repair shops will swap out your entire screen assembly with a Chinese clone and sell the cracked original, this is how 99% of the industry works. This is faster and cheaper (for them). However, the clone assembly has a few subtle problems. Almost all clones use a thicker LCD and thinner, fragile glass to compensate. They have slightly laggy touch response, use a less efficient backlight and a have weak mounting frame which tend to lift up after 2 weeks. Our process takes a bit more time, but the end result is completely worth it. Our work is indistinguishable from the manufacturer’s. Preserving your original hardware and replacing only the glass provides the best quality repair and is usually more cost-effective as well.